On Sunday I proceeded to make my plan for this week. As usual. The only thing is that I forgot that my kids will be racing in Brandys nad Labem, a regatta organized by the Brandys rowing club (president Ondrej Synek), and it doesn’t make sense to be the only family member remaining in Brno, let alone that my single would travel to the race venue anyway because Lenka will be racing it. So my plan to do a 2x3km row on Saturday and a recovery run on Sunday would be difficult to execute. To make things worse, I am in a full week of a training program. At our local site, luckily, but it means that I am doing the training from 8am to 5pm and have to do my day to day job before 8am and after 5pm, which leaves little time for training. Plan goes to the dustbin. I signed up for the Masters 1x race on Sunday, and designed an alternative plan. On Sunday I did a recovery bike ride with the family. Nothing straining. Just a nice ride. Didn’t bother to wear a heart rate belt. The plan (and the revised plan) called for sprintervals, but there was too much wind to go OTW. Also, I had a bad night of sleep from Sunday to Monday, so I decided for an additional rest day. Today’s workout was 6x10min at 190W, with lactate measurements after each 10 minutes. After last week’s step test, this would confirm that my lactate level at 190W would stay steady and below 2.0 mmol/L. 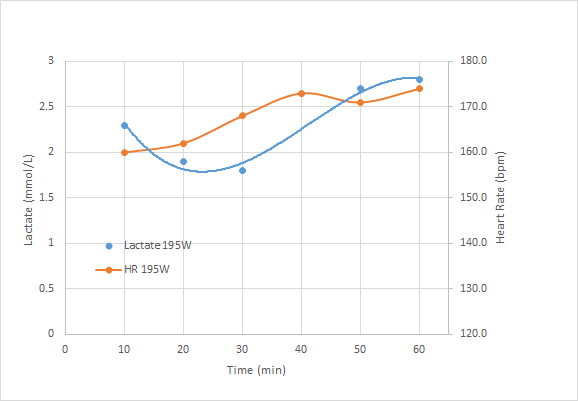 The first measurement was a bit high, but I concluded that could be a “start” effect, and as soon as lactate “burning” would set in, my lactate level would stabilize. I seem to remember something to that effect described in the Olbrecht book. The measurements at 20 and 30 minutes seemed to confirm the theory, so the 3.7 mmol/L after 40 minutes was a shock. Perhaps a failed measurement? I didn’t have time to redo the measurement because I had to go do another 10 minute interval. After 50 and 60 minutes I measured clearly above 2.0 and my perceived exertion was in line with that. 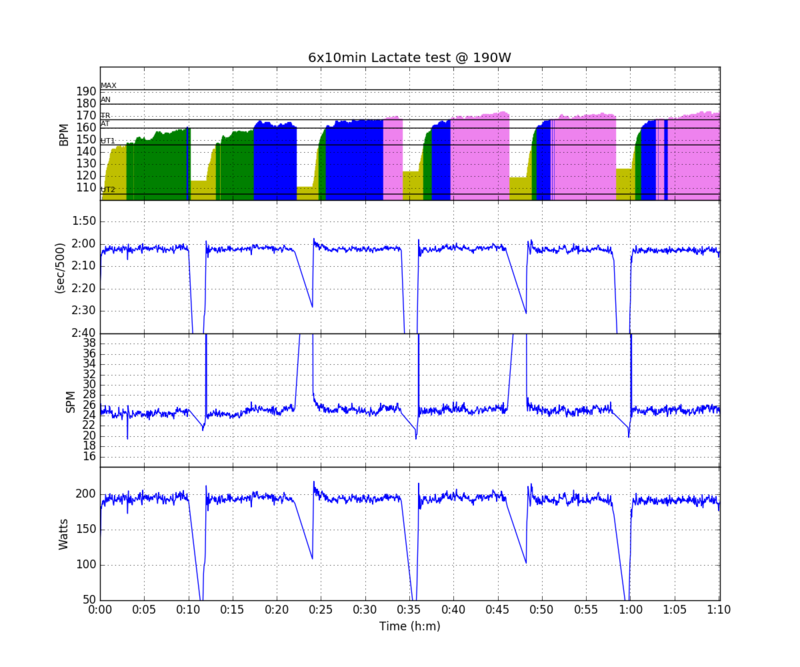 I seem to be able to detect increasing lactate quite well. It suddenly seems harder to hold the required power. Until 40 minutes, I had to force myself to go below 200W and I ended up rowing a few watts above the required 190W and things felt easy. Also, it was easy to reproduce stroke after stroke very similar Watt numbers. When I get tired, there are more power oscillations, and I feel it. The 40 minute measurement is probably a faulty one. I didn’t feel tired yet. My theory is that I was too close to the threshold. My hypothesis is that my reduced fitness has shifted my threshold to the left and also makes me produce much more lactate when above the threshold. So I was rowing on the edge and moved over it after 40 minutes. As soon as I moved over the edge, lactate shot up. As a scientist, I would feel uncomfortable with this level of speculation and hypothesis, but I accept that Lactate measuring, as everything in sports science, is as much an art form as a science. If you have to do a full battery of tests and measurements before you make a decision, you lose too much valuable training time. I am retreating to 180W for my steady state rows and will measure lactate after 60 minutes.